Heating and cooling systems are some of the most important investments you'll ever make in your home. Whether you're buying a new house, renovating an old one or making an emergency purchase because "old faithful" finally conked out, there's a lot riding on the choices you make: Your comfort and safety are at stake, but so is your wallet. Americans typically spend about 46 cents of every dollar they pay in utility bills for "space conditioning." You can lower those costs by selecting the most energy-efficient equipment that meets your needs and fits your budget. The Energy Guide label on home heating and cooling equipment is intended to help you do just that. These labels provide a "snapshot" of the more in-depth energy efficiency and usage information that manufacturers are required to provide with their products -- generally through a fact sheet or industry association directory. The total cost of an appliance has three components -- the purchase price, the cost of repairs and maintenance, and the cost to operate it. The more energy efficient an appliance is, the less it costs to run and the lower your utility bills. Using less energy is good for the environment, too; it can reduce air pollution and help conserve natural resources. What makes one system more efficient than another? Most of the differences are on the inside -- in the motors, compressors, pumps and valves. So even if two models look the same from the outside, these less-obvious features can mean a big difference in your monthly utility bills. How can I be sure energy efficiency claims are not just sales hype? Manufacturers must use standard tests developed by the Department of Energy to prove the efficiency of their products. Many have these tests performed by independent laboratories. The test results are reported on the Energy Guide labels, and through fact sheets provided by the manufacturers or in industry association directories. If your HVAC equipment is more than 10 years old or not keeping your house comfortable, you should have it looked at by a professional HVAC contractor. If it is not performing efficiently or needs upgrading, consider replacing it with a unit that has earned the ENERGY STAR. Most systems have to be 14 Seer or higher to earn the ENERGY STAR approval. Installed correctly, these high-efficiency heating and cooling units can save up to 20 percent on heating and cooling costs. But before you invest in a new HVAC system, make sure that you have addressed the big air leaks in your house and the duct system. Sometimes, these are the real sources of problems rather than your HVAC equipment. Remember that getting the proper size and quality installation is essential to getting the most from your new equipment. When replacing HVAC equipment, bigger doesn't always mean better. If the unit is too large for your home, you will be less comfortable and might actually have higher utility bills. Oversized equipment will operate in short run cycles, not allowing the unit to reach efficient operation and remove humidity from the air — resulting in an uncomfortable home. Your contractor should determine the right size for your HVAC system to be installed. Weatherize your home. Check the caulking, weather stripping and insulation, and make any necessary repairs. This may enable you to install a smaller, less expensive heating or cooling system to get the same results. Compare the performance of different brands and models. Study the product literature. Will the product do the job? How energy efficient is it? What's its repair history? Will it handle your needs today? Ten years from now? Does it fit your budget? Estimate how much the appliance will cost to operate. The more energy an appliance uses, the more it costs to run. Consult the Energy Guide labels, the manufacturers' fact sheets or the industry association directory to compare the energy efficiency of different models. The difference on your monthly utility bill can be significant, especially when considered over the lifetime of the product. You can save money over the long run by choosing a more energy-efficient model, even if it costs more initially. How Do You Say "Efficiency"? If you're referring to furnaces and boilers, it's"annual fuel utilization efficiency," or AFUE. 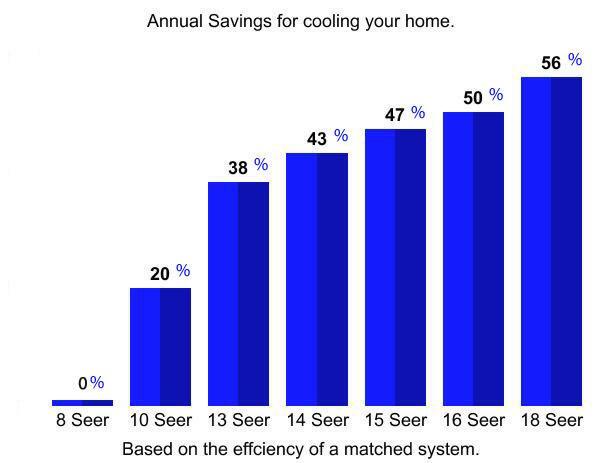 For central air conditioners and heat pump cooling, it's "seasonal energy efficiency ratio," or SEER. For heat pump heating, it's "heating seasonal performance factor," or HSPF. Vacuum air vents, baseboard heaters and radiators regularly to remove dust that reduces heating efficiency. Move furniture, carpet or curtains that restrict their operation. If your baseboard heaters have movable deflectors or vents, open them in the winter and close them in the summer. Schedule annual tune-ups for your heat pump, furnace or boiler. Check to see if your utility company provides this service. Hire a professional to seal and insulate leaky ducts, and to ensure that the airflow distribution system serving your heating or cooling equipment is operating at peak efficiency. Check your attic, attic stairway, attached garage walls and basement to ensure that you have proper insulation between conditioned and unconditioned spaces. Open your foundation vents each spring if your home has a crawl space under it. Close the vents in the winter. Prune back shrubs that may block airflow to your air conditioner or heat pump. Consider installing ceiling fans. The air circulation promotes cooling in the summer and heating efficiency in the winter. What do you know about your home’s heating and cooling system? How often do you even think about it? The truth is, the average homeowner pays little attention to their system until they have a problem. We hope you will find our web site will provide you the knowledge for understanding your current system and the ability to educate and aid you in future heating and cooling needs. Keeping your system on a regular maintenance schedule will keep your system running more efficiently. A more efficient system will result in lower electric, gas and oil bills. Additionally, a well maintained system will reduce the risk of equipment failure which usually occur late night and after hours, resulting in emergency service fees.